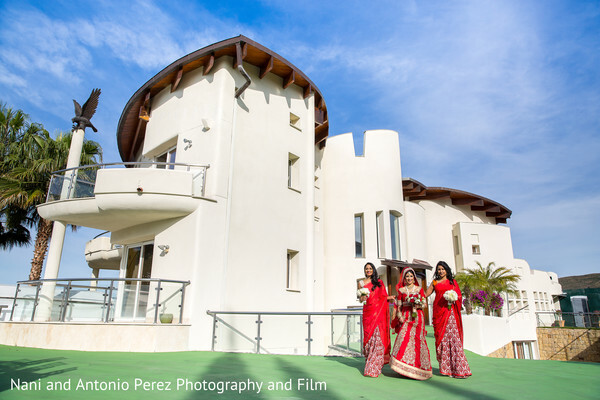 Our Indian bride meets her anxious groom for their chic outdoor wedding ceremony held at Fiestasol wonderously captured by Nani de Perez Photography & Films! 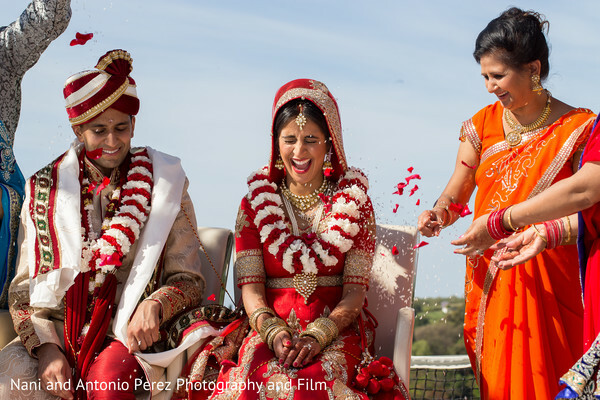 As this charming duo becomes husband and wife during their traditional Hindu wedding ceremony I can't help but notice there is something magical about weddings in Spain! 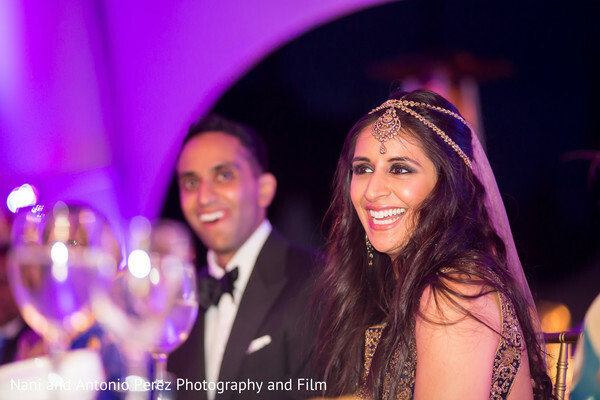 Maybe it's the twinkle in Jigna's eye or the smile on Shamir's face, but these two were truly made for each other. Ready for the evening's festivities Jigna into her navy blue and gold reception attire with fashion by Studio East6 while she opted for a sensual waves hairstyle and a dramatic make-up look! Shamir is dashing in an all black tuxedo as the newlyweds share laughs and intimate moments during their reception portraits! 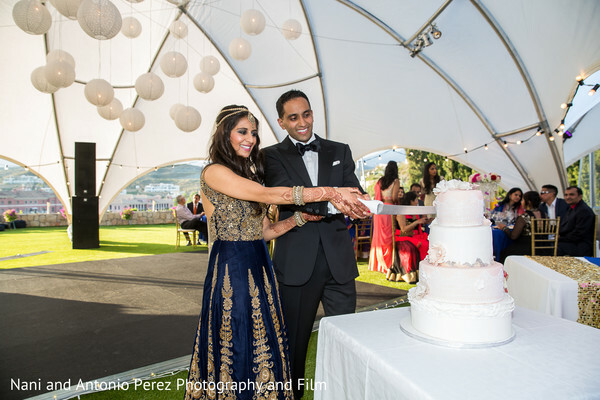 Take a further look in the full gallery for more of this show-stopping couple at their wedding ceremony and reception!
" 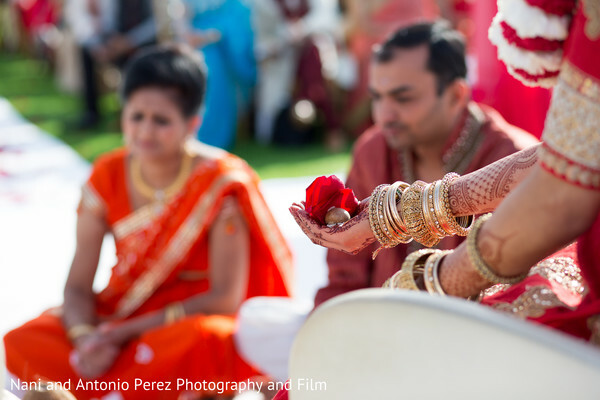 I've always wanted a traditional wedding, so the color palate for the wedding came to me fairly easily. I went with very traditional red, white, and gold colors with pink accents for the wedding. Choosing a reception color palate was more tricky. I wanted a feel for the reception that was modern and elegant. 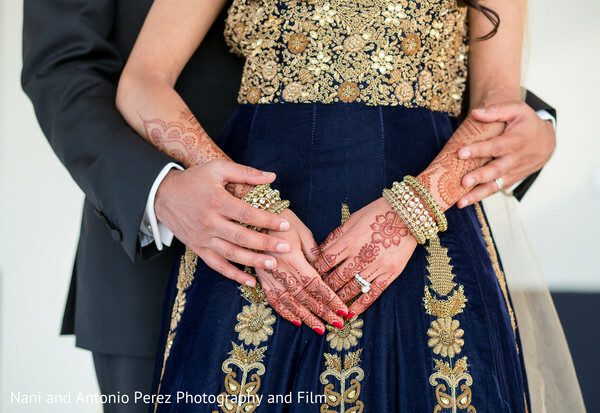 To keep some consistency from the wedding (earlier in the day) gold and white theme, but also introduced a royal blue. 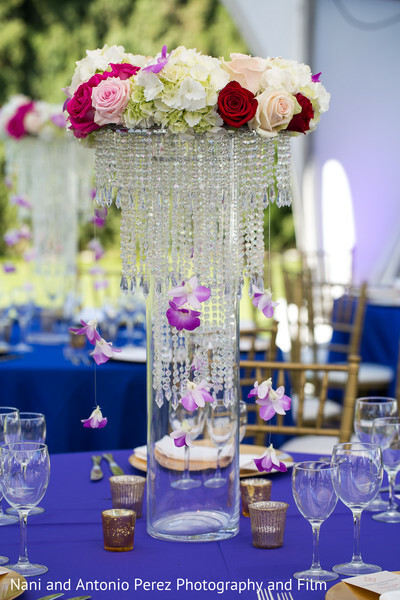 This gave the reception the elegant vibe it needed." "Details, details, details!! I loved planning all of the small details that went into our wedding. I was lucky to have a fiance who was very helpful in planning the wedding and we did many things together. 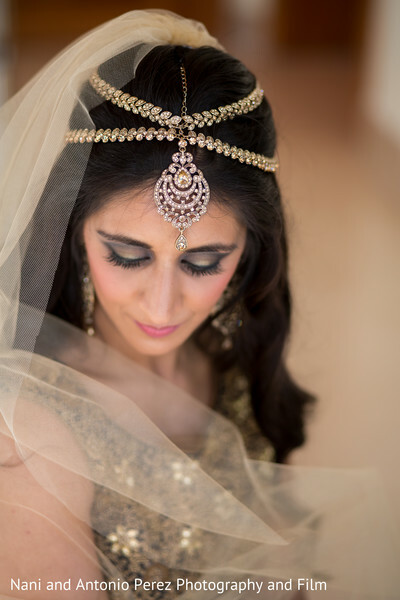 One of my favorite wedding projects was the creation of custom cocktail menus for the garba and wedding reception nights. The menus consisted of some of our favorite cocktails that we had enjoyed during our time together. Enjoying these beverages with our friends and family during our wedding events was a special. I also enjoyed the process of finding the perfect cake topper, creating welcome packages for guests, and making the wedding programs." 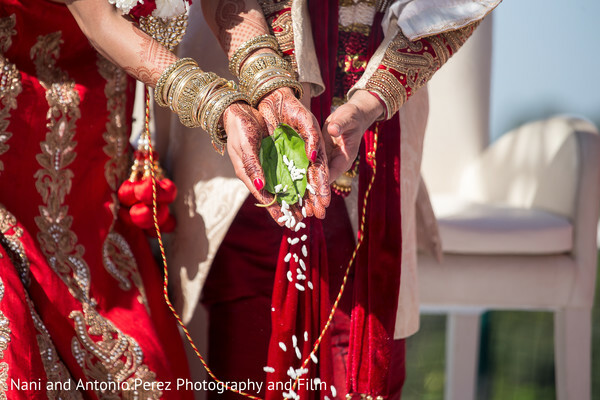 "My most favorite memory with my new husband happened to be right after our wedding ceremony. We rented a vintage getaway car for the wedding, which drove us to a park nearby for wedding pictures. My new husband and I (along with the photographers) spent two hours alone in a park taking pictures. We sipped on champagne in between shots and exchanged stories from the morning and the wedding ceremony. 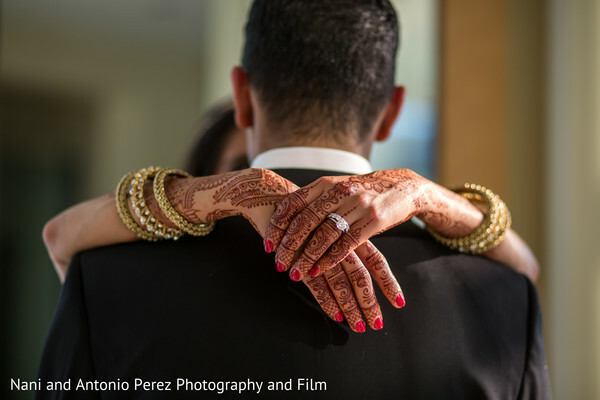 The wedding ceremony seemingly went by fast and getting away for a couple of hours gave us much needed time to take it all in and relax before the wedding reception." 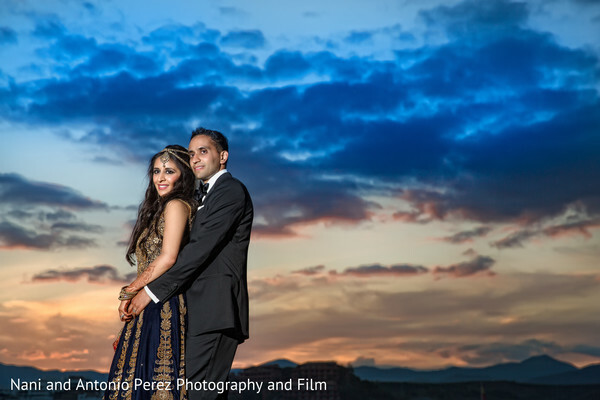 "Our families were incredibly helpful with several aspects of the wedding. I am lucky to have a mom who took care of all of the puja items. His mom also helped out with various details of the wedding. 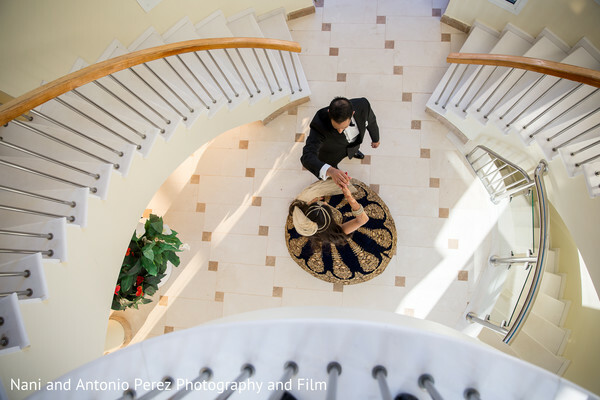 Our siblings were tasked with several days of events, everything from airport runs to last minute errands." Thanks for joining me loves, until the next wedding! Studio East6 is a member of the Platinum Guide. Love what you see? Explore their portfolios.